wonderful weather, amazing sea views and beaches, interesting mixture of Arabian, Mediterranean and British culture, many things to do/see in a small area, good service, great food and a lot of sightseeing and mingling with the locals that you can do for free! I am not the type you’d see in museums and I am not one who’d spend 10 days, 8 hours/day sunbathing. I like a mixture of relaxing (nothing-doing), walking around lovely places, enjoying some quiet moments, tasting good food and talking to people. all this while soaking the local culture. Malta is a lovely please to do that. you can get pretty good deals on hotels. if you prefer to stay in one place during your stay, I’d recommend you settle in Sliema, St. Julians, Bembroke, Gzira, Marsa, the Three Cities or another town on the East coast – it’s where most of the life in Malta happens. not Paceville though – it is East and a lot of life happens there, but it’s so loud at night you couldn’t sleep. Mdina (Rabat) is a must-see. it is the old capital of Malta – small town built within walls with the traditional lime-stone, cute little streets, tiny souvenir and crafts shops. while there, try a cake at Fontanella tea rooms! this will take you 1/2 day incl travel. assuming you travel here from the East, pop in to Mosta on the way back. it’s not much of a town but The Mosta Dome is one you have to see – very impressive architecture. walk into the main hall of the church and look up to see the charming dome. be brave and walk through one of the small halls that take you to the back chambers. there you will see a replica of the 200kg bomb, which in 1942 pierced the dome and didn’t explode. 300 people were gathered there hiding from the air-raid. a very traditional thing to do on Sunday is going to the Fish market. it is in the fishing city of Marsaxlokk. don’t worry about finding your way there – just follow the crowd! everyone is there on Sunday morning. amongst all the Chinese goods that you can buy in every corner of the world, you will find the most peculiar types of fish, all fresh and offered to you with lots of passion from the local fishermen. for lunch – fresh fish, of course! have some Maltese bread with it. in the afternoon you can go to the beach in Marsaxlokk – it’s one of the few sand covered ones in Malta and has a view to it’s second largest harbour. do NOT leave Malta before going to the Blue Lagoon! take a boat from Cirkewwa, they leave every hour and come back until 17:00, 10 euro return ticket. 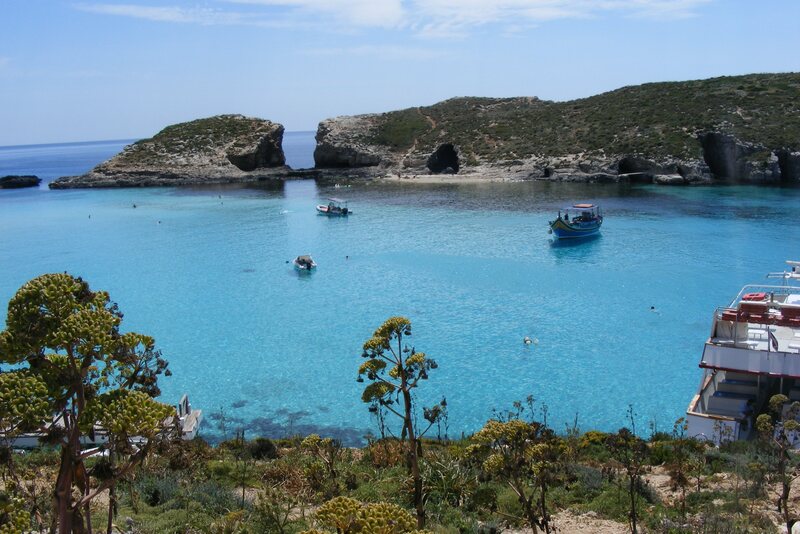 if you can – stay a night in the Comino Hotel – very quiet, inexpensive, good food and their boat is only 5 euro return. 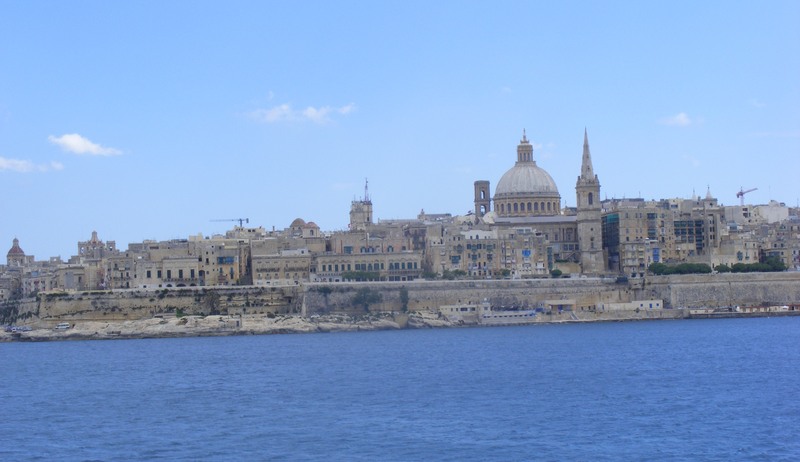 from Cirkewwa you can also get a ferry to Gozo. I wrote about a day in Gozo here. Just make sure you don’t miss the 360* view from the Citadela in Victoria, the Azure window – get a boat there for 3.50 Euro and the Calypso cave which is assumed to be the cave mentioned by Homer in `The Odyssey’ where Calypso, the beautiful nymph kept Odysseus as a `prisoner of love’ for seven years. back in Malta, spare an evening to watch the sunset in Fomm ir-Riħ Bay (West coast). why not have a picnic there – tasty vegetables, good old smelly cheese and freshly baked bread are all Malta specials. undoubtedly, the best company for them is Maltese wine – it’s cheap, tasty and very good quality. talking about wines – you may want to book your holiday in the first week of September and enjoy the Qormi Wine Festival. I haven’t done it but it has two of my favourite words in it and it’s free! surely must be good! other annual happenings that may help you choose the dates of your holiday here.